Free Photo Webinars focuses on DSLR camera gear this month. 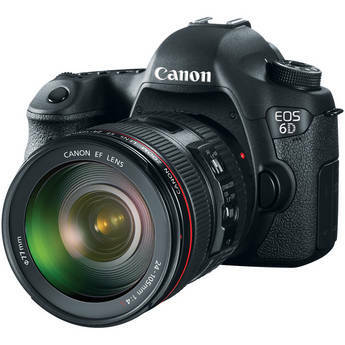 The Canon EOS 6D Digital Camera is a full-frame 20.2 megapixel DSLR.Many of the major camera manufacturers have been releasing their new DSLR lines over the past months. I think we have had enough of a turnover in the big three -- Canon, Nikon & Sony -- that we can spend some time talking about the differences and provide helpful advice for anyone who might be in the market to upgrade. The new line of DSLR bodies -- what are the differences and which might be right for you? Lenses, lenses and lenses -- an overview of different types of lenses, a look at the new entries to the market, and some ideas of what should be your next lens. Accessories -- What other gadgets ought you have in your camera bag? Used vs. new -- When is used a good option? What should I consider before buying a used camera? Where do I find the best deals? These are the questions you've been asking me, and I'll be answering them all. If you have other specific questions, share them when you register. Note: We will focus just on the DSLR market with this broadcast. I'll deal with other formats at a different time.